Meet your host Juan at his home and walk together to Mercado de Maravillas - an indoor, covered neighborhood market where locals shop for their ingredients. Walk through the market and explore fresh produce sold by Juan's favored vendors. You'll purchase ingredients such as fresh vegetables, seafood and rice (from a specialty rice store where you learn about rice varieties from all over the world) that you'll use during your cooking lesson. Back home, join Juan at his small kitchen to learn to cook a traditional Spanish meal from recipes that he has perfected over the years. During your hands-on cooking class, you'll prepare the ingredients for your dishes, then take a break to snack on jamon and queso before you finish cooking your meal. 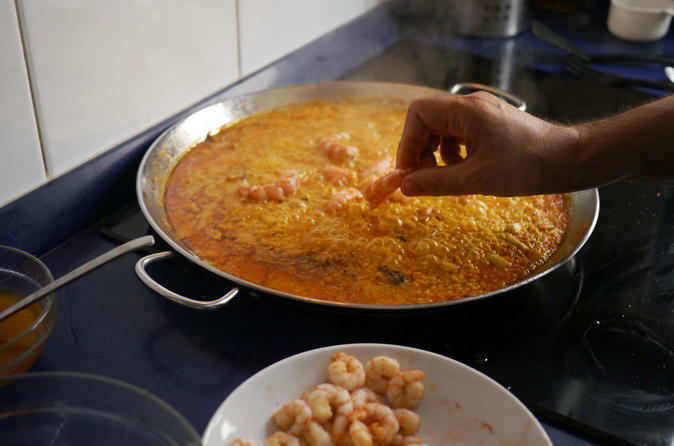 You'll learn to cook three dishes from scratch, two tapas and a paella. Learn how to clean squid, handle mussels and skin tomatoes as you cook with Juan before you sit down at the table to share the meal you helped prepare! Your meal with Juan may include dishes such as mejillones al vapor (steamed mussels with a touch of lemon), gambas al ajillo (shrimp in garlic sauce) and a traditional paella. You will enjoy your traditional Spanish meal over beer or wine with Juan. Please note that the broth for your paella will be prepared ahead as it takes several hours to prepare. Your meal will conclude with a dessert of fruit or cake with organic local ice-cream purchased at the market. A Madrid native, Juan loves meeting new people and sharing the art, architecture, food and history of his city. Juan and his family lived in the US for six years where he developed a love for cooking as he took care of his children. When he returned to Spain a few years ago, he wanted to continue developing his passion for food which has always been a big part of his life and started offering cooking experiences and meals to travelers from around the world. Be sure to ask Juan for his favorite restaurant recommendations, he loves giving travelers his favorite local tips! Juan is happy to accommodate vegetarians and vegans so let him know when making your booking if this applies to you. You may be joined by other travelers but the max group size will not exceed six. The seafood section of the market is closed on Fridays.